The “First Americans” are usually believed to be East Asian migrants that crossed the Bering Straits 15,000 years ago, members of the Clovis Culture (a reference to their stone tool technology). A small number of researchers have suggested that an earlier group of migrants, from Europe’s Solutrean culture, arrived in North America a couple of millennia before these Clovis settlers, a hypothesis which was hotly disputed by academics. It now appears that researchers favoring both the Clovis and Solutrean models have got it all wrong and supporting the claim of “First Americans” should be given to a mysterious population living in Brazil over 23,000 years ago. Archaeologists associated with the National Museum of Natural History in Paris have recently confirmed that bone ornaments discovered in soil layers at the Santa Elina rock shelter in the Mato Grosso province of Central Brazil date to at least 23,120 years in age. The scientists discussed their findings in a paper, “Peopling South America’s Centre: The Late Pleistocene Site of Santa Elina,” published in Cambridge University’s archaeology journal Antiquity (August 8, 2017). 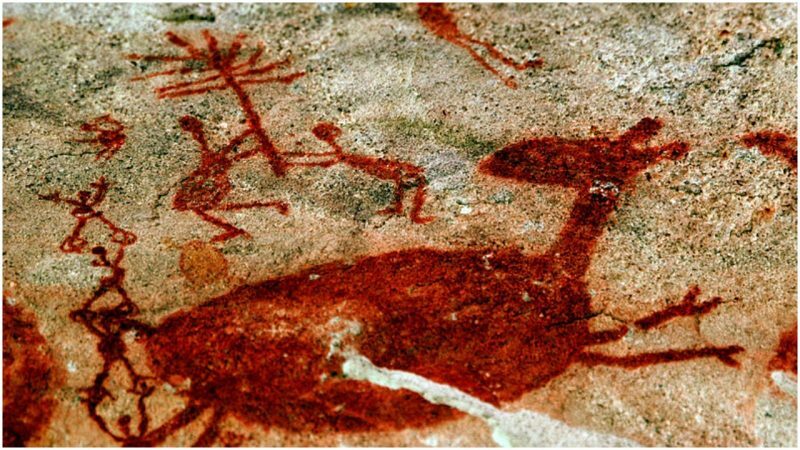 The Santa Elina rock shelter, in Central Brazil, is home to extraordinary rock art and evidence of lengthy occupation by the first Americans. Occupation of the site is dated to several different periods, suggesting that groups of hunter-gatherers only lived at the site when climate favored hunting in the region. The irregular periods of occupation spread across the Late Pleistocene and Late Holocene. 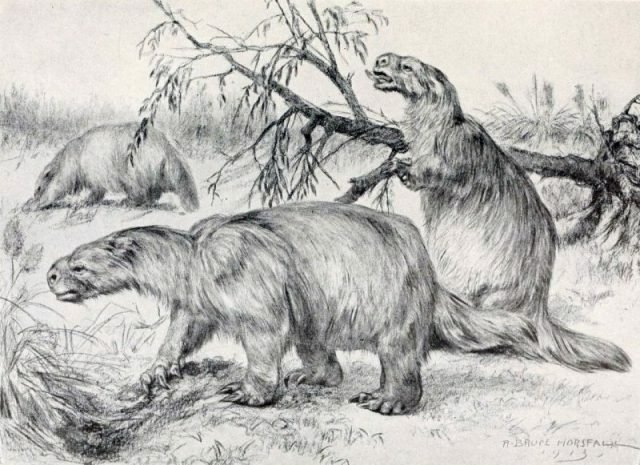 Excavations carried out at the Santa Elina rock shelter between 1984 and 2004 explored three sediment layers containing the remains of hearths, stone artifacts, and bones associated with the extinct giant sloth species Glossotherium. Several of the bony plates from the sloth skin had been converted into ornaments of some kind by the resident humans. The added notches and holes may have allowed these plates to be worn on the body. Glossotherium, like other giant ground sloths, was a herbivore. It was 13 feet in length and weighed 2,210 pounds. It would have been one of the largest herbivores in South America. This species became extinct around 12,000 years ago. Scientists utilized three separate dating methods to investigate samples of charcoal, sediment, and the sloth bones. The revealed dates securely place people at the Santa Elina site well over 23,120 years ago. Humans groups abandoned the site after a short period, but later groups utilized the rock shelter again between 10,120 and 2,000 years ago. For numerous years, archaeologists working at human occupation sites across Brazil have produced evidence of extremely early colonization of this South American region. The earliest dates associated with Brazilian archaeological research projects suggest perhaps 50,000 years of occupation. These very early dates for initial colonization of the continent remain highly controversial. Not only is Santa Elina located far from even the earliest Clovis sites, it is also over 1,000 miles from the Brazilian coast in a heavily forested region. This seems like an unlikely first point of entry as it is logical to suspect that humans lived initially along the coastline before moving into the Brazilian interior by 23,000 years ago. This would seem to offer further support to claims that modern humans were in Brazil long before even this early period. Opinion is divided over where these First Americans likely came from. Some suspect they drifted across from West Africa in rafts, others suggest that they were Oceanians who used canoes to move along the Antarctic coast before eventually arriving at Tierra del Fuego, a group of islands situated at the bottom of South America. Bruce R. Fenton is a researcher of human evolution and ancient hominin migrations, with a special focus on the rise of the first /Homo sapiens/. Fenton is the author of the pop-science book ‘The Forgotten Exodus: The Into Africa Theory of Human Evolution,” as well as a regular guest writer for several online magazines. His research interests have taken him to all six inhabited continents and led to his being featured in the UK Telegraph and acting as an expedition leader for the Science Chanel. He is a current member of both the Palaeoanthropology Society and the Scientific and Medical Network.